The Malnar Air-Cooled Condenser is thermodynamically engineered to provide a cost effective solution to your industrial refrigeration needs. The pressure drop through the condenser is minimized giving you more refrigeration for your money. The high efficiency, low maintenance, all aluminum design allows for a quick return on your investment. From our factory to your plant, Malnar Air-Cooled Condensers set the standard for quality and performance. Like all Malnar products. ACC units are professionally engineered and painstakingly constructed to the most demanding specifications. All materials are carefully selected for optimum efficiency. The condenser coil is constructed from 5/8″ or 3/4″ heavy wall aluminum alloy tubing giving high thermal conductivity while providing a long operating life. Helically wound aluminum fins, at 8 fins per inch, are mechanically bonded to the tube providing efficient extended surface for increased capacity. Some units have a single coil while larger custom units have two coils. Single-circuit and multiple-circuit connections can be provided on any size unit when requested. The housing is constructed of heavy gauge aluminum sheeting to fully enclose the coil, including the return bends. Divider baffles located between fan sections give added rigidity. Fan panels with rolled orifice rings provide optimum fan performance. All additional members are of structural grade aluminum. All fasteners are stainless steel. 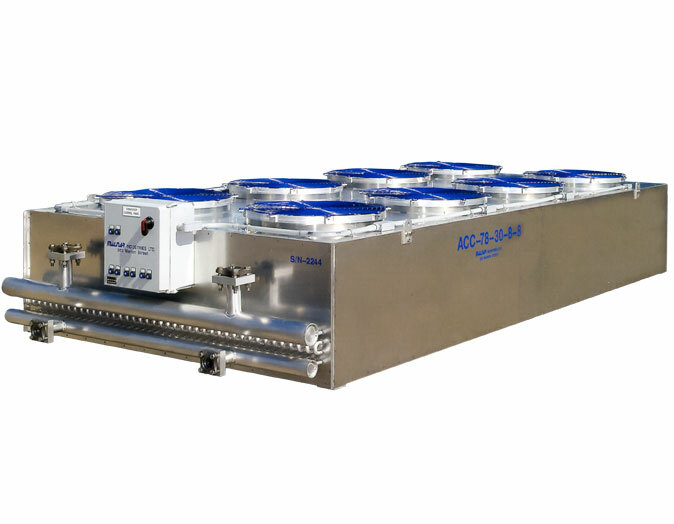 All condensing units incorporate single or multiple vertical discharge fans. The draw through design and large plenum spacing ensures an even air flow over the face of the coil. Wide blade axial fans are direct driven at 1140 RPM by totally enclosed electric motors which are factory wired to a sealed weather resistant junction box. Optional fan cycling controls are also available on request.